“Hyrum Leggroan, the clever colored halfback of the Granite High school football squad will captain the 1910 aggregation of pigskin chasers when the season rolls around again,” the Salt Lake Herald announced in December 1909. Leggroan’s unanimous election as team captain that year reflected the central role he played on Granite High’s football team as well as the high esteem with which his teammates held his athletic abilities. He was re-elected to the same position the following year, or at least a Salt Lake Telegram reporter guessed that he likely would be: “Apparently Captain Hyrum Leggroan stands a good chance of carrying away the plum as he is about the most popular man to be found at the institution,” the Telegram noted. 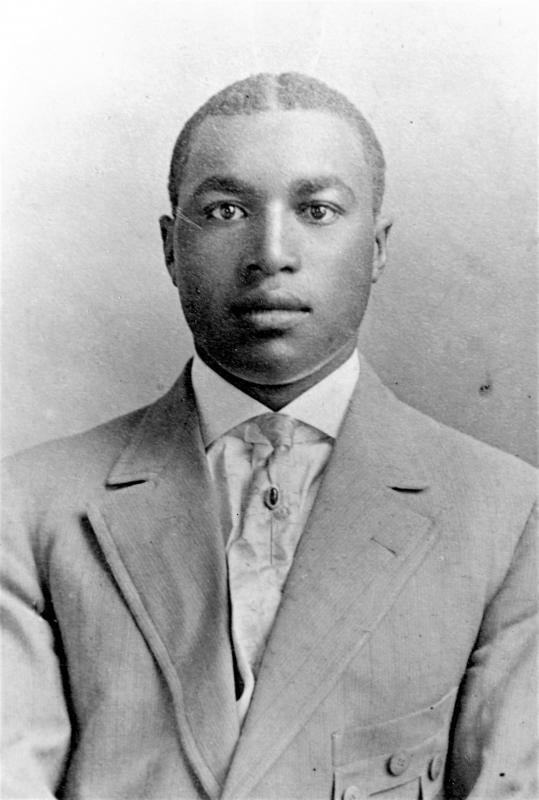 When Hyrum attended Granite High during the early decades of the twentieth century he was one of only a few black students at the predominately white Salt Lake City school. Hyrum, the eldest son of Henry Alexander and Esther Jane James Leggroan was born and reared in Mill Creek, a farming community southeast of Salt Lake’s downtown. His parents, both LDS, farmed there for more than fifty years. Hyrum and his siblings contributed significantly to the never-ending work which farm life entailed. The farm was the family’s primary source of income and the children were thus integral to its success. Hyrum certainly learned from experience that hard work was necessary in cultivating a self-sustaining farm. Hyrum came from hearty Mormon pioneer ancestry. His grandparents on both sides, also Mormon, were ranchers and farmers. His great grandmother, Jane Elizabeth Manning James, who arrived in Utah in 1847 as a devoted LDS convert, worked in the households of Joseph Smith and Brigham Young. Hyrum was less than one month shy of his nineteenth birthday when his great-grandmother passed away in April 1908. It was a notable event in the Salt Lake Valley as the then leader of the LDS Church, Joseph F. Smith, spoke at her funeral. It is hard to imagine that Hyrum was not there and likely gained a deeper appreciation for his prominent pioneer heritage. In 1912 Hyrum married Nancy Caroline Leggroan or “Carrie” as she was called. Carrie, the daughter of George and Sina Green Bankhead, was born in Wellsville, Utah. Her father was brought to Utah as a slave of John and George Bankhead. At the time they married, Carrie was not a member of any church, but joined a Seventh Day Adventist congregation in 1929. She remained in the Adventist faith, and Hyrum retained his LDS membership. They had three daughters and one son. One daughter, Sina, died as an infant. Mildred, their oldest daughter, and their son Douglas received baby blessings in the Wilford Ward, and Mildred, at least, was baptized. No baptism record has been found for Hyrum’s youngest daughter, Donna, who was born almost twelve years after her older sister, Mildred. When she sat for an oral history in 1977, Hyrum’s wife, Carrie, said that Mildred’s grandparents (Henry and Esther Jane James Leggroan) had taken Mildred to the Tabernacle to be baptized. The baptism would have taken place before Carrie became an Adventist. Bankhead, Henrietta Leggroan. Oral interview by Florence [Leggroan] Lawrence. Salt Lake City, Utah, 1977. Transcript. Helen Zeese Papanikolas Papers, 1954-2001. Ms0471. Box 2, folder 3. Special Collections. J. Willard Marriott Library. University of Utah, Salt Lake City. “Boys Deserve Credit.” The Butte Miner (Butte, Montana), 26 Nov 1901. Church of Jesus Christ of Latter-day Saints, Record of Members Collection. Miller Ward, Part 1, 1907-1935. CR 375 8, box 4218, folder 1, item 84. Church History Library, Salt Lake City, Utah. Church of Jesus Christ of Latter-day Saints, Record of Members Collection. Miller Ward, Part 2. CR 375 8, box 4219, folder 2, item 514. Church History Library, Salt Lake City, Utah. Church of Jesus Christ of Latter-day Saints, Record of Members Collection. Wilford Ward, Part 1, 1907-1941. CR 375 8, box 7640, folder 1, image 31. Church History Library, Church of Jesus Christ of Latter-day Saints, Salt Lake City, Utah. “City Candidates Campaign in Primary Race.” Salt Lake Tribune (Salt Lake City, Utah), 15 October 1945. “Class of Sixteen to Finish at Granite,” Salt Lake Telegram (Salt Lake City, Utah), 8 May 1911. “Colored Football Star to Lead Granite Team.” Salt Lake Herald (Salt Lake City, Utah), 2 December 1909. “Engine Severs Woman’s Hand in Mishap.” Salt Lake Telegram (Salt Lake City, Utah), 7 March 1946. “Game Little Granite Team is Playing Under Heavy Odds,” Salt Lake Telegram (Salt Lake City, Utah), 7 November 1910. “Granite Defeats Jordan,” Salt Lake Herald (Salt Lake City, Utah), 22 October 1910. “Granite Expects to Make Good Showing,” Salt Lake Telegram (Salt Lake City, Utah), 15 October 1910. “High Jinks at Granite Saturday.” Salt Lake Telegram (Salt Lake City, Utah), 7 December 1910. Leggroan, Celia Bankhead and Carrie Bankhead Leggroan. Oral interview by Ronald Coleman. Salt Lake City, Utah 1977. Transcript. Helen Zeese Papanikolas Papers, 1954-2001. Ms 0471, box 2, folder 8. Special Collections. J. Willard Marriott Library. University of Utah, Salt Lake City. Leggroan, Hyrum. United States World War I Draft Registration Cards, 1917-1918. Salt Lake County, Utah. Washington D. C.: National Archives and Records Administration. Family History Library, microfilm 1,983,910. Church of Jesus Christ of Latter-day Saints, Salt Lake City, Utah. Leggroan, Hyrum. United States World War II Draft Registration Cards, 1942. Salt Lake County, Utah. St. Louis, Missouri: National Archives and Records Administration. Record Group 147, Roll 38. “Leggroan.” Presiding Bishopric stake and mission census, 1914-1935. Granite Stake, Miller Ward. 14 Dec 1914, 27 Oct 1925. CR 4 311. Church History Library, Church of Jesus Christ of Latter-day Saints, Salt Lake City, Utah. “Leggroan Will Remain with Granite High Nine.” Salt Lake Tribune (Salt Lake City, Utah), 11 April 1911. “More than 210 County School Graduates to be Give Diplomas.” Salt Lake Telegram (Salt Lake City, Utah), 4 June 1907. “Prospects for Eleven Good at Granite High,” Salt Lake Herald (Salt Lake City, Utah), 18 September 1910. “Sixteen Students to Receive Diplomas.” Salt Lake Tribune. (Salt Lake City, Utah) 9 May 1911. “Railroad Team Triumphs Over Federal Reservemen.” Salt Lake Telegram (Salt Lake City, Utah), 3 September 1926. “Salt Lake City Primary Favors Incumbents.” Salt Lake Telegram (Salt Lake City, Utah), 24 October 1945. “Telling Play of Leggroan Beats Sugar.” Salt Lake Telegram (Salt Lake City, Utah), 22 July 1931. Utah. County Marriages, 1887-1937. Hyrum Leggroan and Carrie Bankhead, 26 June 1912. Database, FamilySearch. Microfilm 429,080. Family History Library. Church of Jesus Christ of Latter-day Saints, Salt Lake City, Utah. Utah State Board of Health. Bureau of Vital Statistics. Certificate of Death. Leggroan, Hyrum. File No. 1560. Registrar’s No. 1571. Utah State Archives. Salt Lake City, Utah. “Colored Football Star to Lead Granite Team,” Salt Lake Herald, 2 December 1909. “High Jinks at Granite Saturday,” Salt Lake Telegram, 7 December 1910. Henrietta Leggroan Bankhead, interview by Florence Lawrence, Salt Lake City, 1977, transcript, Helen Zeese Papanikolas Papers, 1954-2001, Ms 0471, box 2, folder 3, page 31, Special Collections, J. Willard Marriott Library, University of Utah, Salt Lake City. Church of Jesus Christ of Latter-day Saints, Record of Members Collection, Wilford Ward Part 1, CR 375 8, box 7640, folder 1, image 31, Church History Library, Salt Lake City, Utah. “Boys Deserve Credit,” The Butte Miner, (Butte, Montana) 26 Nov 1901. “Leggroan Will Remain with Granite High Nine,” Salt Lake Tribune (Salt Lake City, Utah), 11 April 1911. “Sixteen Students to Receive Diplomas,” Salt Lake Tribune (Salt Lake City, Utah), 9 May 1911. Utah, County Marriages, 1887-1937, Hyrum Leggroan and Carrie Bankhead, 26 Jun 1912. Database, FamilySearch, Microfilm 429,080, Family History Library, Church of Jesus Christ of Latter-day Saints, Salt Lake City, Utah. Celia and Carrie Bankhead Leggroan, Oral Interview by Ronald Coleman, Salt Lake City, Utah, 1977, transcript, Helen Zeese Papanikolas Papers, 1954-2001, Ms 0471, box 2, folder 8, page 9, Special Collections. J. Willard Marriott Library, University of Utah, Salt Lake City. Church of Jesus Christ of Latter-day Saints, Record of Members Collection, Miller Ward, Part 2, CR 375 8, box 4219, folder 2, image 514, Church History Library, Salt Lake City, Utah. Celia and Carrie Leggroan, oral interview, 24. Hyrum Leggroan, United States World War I Draft Registration Cards, 1917-1918, Salt Lake County, Utah, Washington D. C.: National Archives and Records Administration, Family History Library, microfilm 1,983,910, Church of Jesus Christ of Latter-day Saints, Salt Lake City, Utah. Hyrum Leggroan, United States World War II Draft Registration Cards, 1941, Salt Lake County, Utah, St. Louis, Missouri: National Archives and Records Administration, Record Group Number 147, Roll Number, 38. “Telling Play of Leggroan Beats Sugar,” Salt Lake Telegram , 22 Jul 1931. “City Candidates in Primary Race,” Salt Lake Telegram,15 October 1945; “Salt Lake Primary Favors Incumbents,” Salt Lake Telegram, 24 October 1945. Celia and Carrie Leggroan, oral interview, 16. “Engine Severs Woman’s Hand in Mishap,” Salt Lake Telegram , 7 March 1946. Celia and Carrie Leggroan, oral interview, 20.